The Canadian Platinum Maple Leaf Coin is one of the major platinum bullion coins which is available to collectors and investors today. For more than a decade, it was considered the standard platinum coin to collect. First produced in 1988, fractional weight coins of .9995 millesimal fineness were available until 2001. 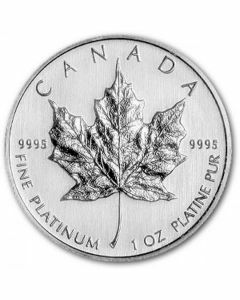 After a pause in production in 2002 due to the increased prices of this precious metal, the Platinum Maple Leaf was reintroduced in only the 1 ounce size starting in 2009. What Is the History of the Canadian Platinum Maple Leaf Coin? The Platinum Maple Leaf shares the same iconic design as the other official Canadian precious metal coins that the Royal Canadian Mint has produced since 1979. The obverse features a profile image of Queen Elizabeth II designed in 2003 by Susanna Blunt, while the reverse offers the three-point maple leaf, the fineness of the metal, and the weight of the coin. The 1 ounce platinum coins offer a $50 CAD legal tender face value although they are actively traded based on their platinum bullion content value, Canadian government guarantee, and seignorage fee price premium. In 1988, when the first Canadian Platinum Maple Leaf Coins were offered, the country ranked third in global platinum production behind South Africa and Russia, which was referred to as the Soviet Union at that time. At virtually the same time, the automobile industry announced that it was trying a different material other than platinum for catalytic converters, which created an initial fear of price drops. Sales were consistent, sometimes even doubling from year-to-year, because of the price of this precious metal, and in 2002 this paid off for investors because of market conditions. Canada actually stopped producing platinum coins in 2002 because of how high the prices for this metal were, which hampered demand for the Platinum Maple Leaf. It would be 7 years before the Royal Canadian Mint would begin offering this rare platinum bullion coin once again. The Royal Canadian Mint also offers extremely limited runs of commemorative platinum coins, some with the maple leaf design, in addition to the standard platinum bullion coin. A 25th Anniversary edition of the Platinum Maple Leaf was created in 2013, for example, and limited to a mintage of 250, with sales of 1 per household allowed. From gold-plated maple leaf designs to wildlife images, the millesimal fineness and weight of each coin bears the same guarantee of quality from the mint as the bullion coins do. Why buy Canada Platinum Maple Leaf Coins? The Royal Canadian Mint produces one of the purest platinum coins that is available on the market today. 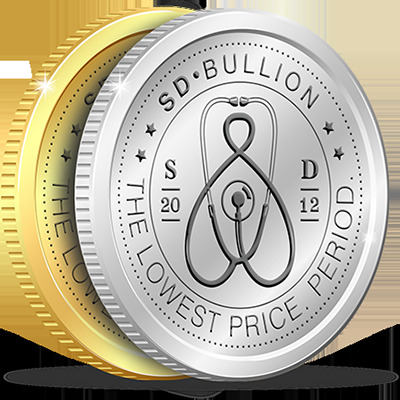 Each 1 ounce coin is 30mm in diameter and offers an official weight of 31.110g. As with other coins produced in Canada, the Platinum Maple Leaf has modern security features, including micro-engraving and radial line backgrounds, which give this coin a very unique light diffracting pattern. When you purchase a modern issue platinum coin from Canada, you can quickly tell if it is an authentic product. The Royal Canadian Mint also limits the number of platinum coins it produces on an annual basis and the total number created has been declined year-to-year. Combine this with the fact that the number of platinum coins sold has been increasing by up to 50% each year and that few financial institutions actually purchase these coins, it means that there are plenty of potential opportunities for collectors and investors to explore what platinum could provide for their portfolio. If you do collect platinum coins like the Maple Leaf, it is important to store them in coin holders or accessories that are not made from PVC. The PVC molecules in these containers are known to breakdown over time and this can leave a patina on your platinum coins. Platinum does not corrode, but it can be contaminated by high humidity environments, so it is based stored in a dry area with humidity levels which are below 75-80%. The selling price of the world's best platinum coins is affected by the condition of the coin itself. If there are defects on the coin due to poor handling or storage, it can affect the value of your investment. For this reason, most platinum coins like the Maple Leaf are shipped in protective materials soon after they've been minted. You will also want to take additional protective steps for storage or ask your preferred storage agent what conditions exist for your location to ensure the quality of your coin. If you're looking to diversify your portfolio or you've always been interested in platinum coins, then the Canadian Platinum Maple Leaf is a guaranteed coin to consider taking home today. Lastly, Royal Canadian Mint Platinum Maple Leaf coins are also eligible in a Platinum IRA investment holding.